January of 1992 saw the release of the much lauded 1985 vintage – a wine of great distinction characterised by aromatic intensity and a balanced constitution. The harvest had begun on the 30th of September in what could only be described as ideal conditions, but the year hadn’t started out as obviously prosperous. The winter, January in particular, had been exceptionally cold and a lingering hard frost throughout the entire spring had caused the loss of several thousands of hectares of vines. It wasn’t until July that the weather finally picked up and, when the sun came out, the flowering managed to pick up pace and recover from the slow start. In the end, the harvest was started only a couple of weeks later than usual. The blend was split 40% Pinot Noir and 60% Chardonnay with the Pinot grapes contributing body and structure to the subtle and persistent aromas of the Chardonnay. The wine was described by Moét as being complex and warm, toasted and sweet, with hints of almond and walnut. Tasting the wine in late 1991, winemaker Dominique Foulon described his creation as giving a floral attack to the nose, with added honey and preserved fruits. On the palate he described it having the darker notes of figs, raisins and undergrowth, and a finish that was long and precise. In addition to the vintage release a Rosé was also released at the beginning of 1995. This was again characterised by the vegetal notes and the candied red fruits from the ripe Pinot grapes, and added hints of brioche and lemon citrus. The year of 1986 saw a first for the brand and, at the current time of writing, is still the only time that a Rosé Dom Pérignon has been released without a vintage wine being made as well. The answer as to why this anomaly occurred lies in the weather for that year which has been described as both unpredictable and dramatic. A cold winter led in to an equally poor spring, but the vines remained healthy and bud burst occurred around the 7th of May, just a few weeks later than usual. Warm sunshine soon arrived and the rising temperatures in June saw flowering begin on the 25th of the month. Summer remained modestly sunny and warm, but heavy rains hitting from the 10th of August until early September ensured that the possibly high yielding crop was now subject to rot and strict grape selection. A last burst of dry weather from the 18th of September pushed the harvest back slightly to ensure that grapes could maximise their ripening time and was commenced between the 28th of September and the 2nd of October, depending on variety. With the Pinot Noir grapes faring better than the Chardonnay (which hadn’t fully ripened and were a touch too acidic) it was felt that the flavour profile better suited a darker Rosé release than a short living and (perhaps) harsher vintage release. The final blend was 60% Pinot Noir and 40% Chardonnay. The official tasting guide for the wine references these attributes and describes the wine as being pale rose in colour, with gentle shades of copper and very fine bubbles. The aromas were of fresh cherries and redcurrants and gave way to notes of mirabelle plum and toasted bread. On the palate, there was the sensation of roundness, purity and concentration, perfectly balanced by an almost youthful liveliness. Available in September 1996, one final thing to note about this unique release was that it was the last Rosé to come in a green coffret identical to that of the vintage release (which may have been a touch confusing in a year where no vintage 1986 was released). From the next Rosé vintage onwards (1988) they would come in pink/rose coloured coffrets more befitting of their contents. 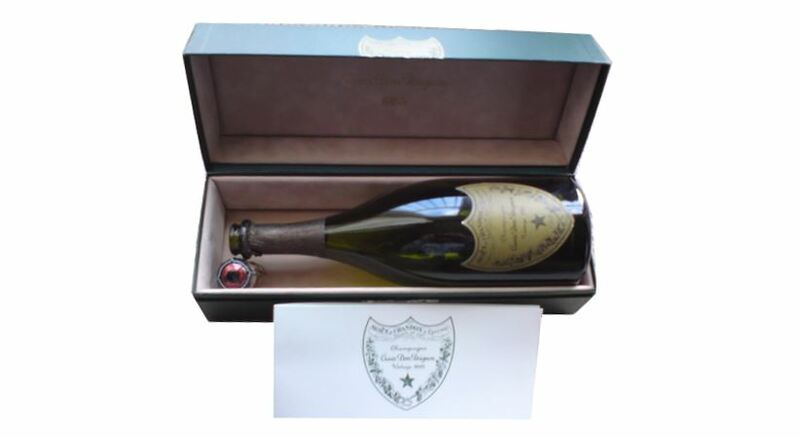 As if to herald the long seen phenomenon that Dom Pérignon was rarely released in three successive vintages (and certainly continuing the trend for Dom vintages not to be released in years ending with a 1 or a 7), 1987 saw poor weather and resulted in no wines being released. A wet spring was followed by a wet summer with the weather perking up for just 3 weeks in August. This late sun wasn’t enough to stop what was an average harvest producing a small crop suitable only for topping up reserve stocks. Next up was the ‘very good’ vintage of 1988 which would prove to be extremely long lasting wine and one which was very much in demand. An extremely mild winter saw early and rapid flowering of the vines, but only produced a limited number of potential bunches (quantities were down approximately 10% on the moderate crop of the previous year). Summer was marked with heavy rains alongside sunny weather and high temperatures but, conversely, the rains helped to swell the grapes available. The sun returned in August and picking began on September 26th for the Chardonnay and the 27th for the Pinot Noir, with the final vintage being comprised of 55% Chardonnay and 45% Pinot Noir. On the nose it was described as floral, citrus, toasty vanilla, graphite and walnut. The palate added almond and bitter marmalade, culminating in a long and fine finish. The Rosé release for 1988 showed dry figs and candied cherries to the nose, adding spice and vanilla to a palate described as dense, vigorous and precise. The vintage release would come to market in the early part of 1995, with the Rosé release following in 1998. Initially declared to be a great year but steadily reduced over time to ‘very good’, the harvest of the 1989 was generous in yield and declared by many Champagne houses. Noting the quality and extra time needed for the 1988’s to fully realise their potential, some houses released the youthful and early drinking 1989 first. Moét decided to hold back and, in a curious mirroring of the start of the decade where patience with the tempting 1981 vintage gave way to the superb 1982’s, the 1989 grapes were still young in their bottles when the superb quality of the 1990 vintage was spotted. The 1989 vintage was ultimately skipped in favour of the upcoming potential presented by the new decade.